“Dear Val, I want to say thank you because what you have taught and shared have helped enormously. I was in your recent animal communication class for senior dogs. Although I did not join the discussions, I have listened to the recordings. 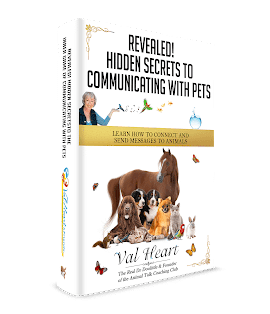 I have also gone through your beginning animal communication home study course. I just want to tell you that your course and the senior dog class have helped me and in turn my dear girl, Jojo, a great deal in our most difficult time. Jojo has been suffering from heart problems and liver as well as kidney problems for a few years but was managed satisfactorily until early September when suddenly things took the downward course quickly. With the help of the vet and energy healing, she still had some good days in the last month of her life. With what I have learnt from you and others in the class, I trust I have done what Jojo has wanted to do, eg taking her to the Peak (we are in Hong Kong) for a walk in her stroller and taking her home on the day before the last day of her life on earth and having my mum holding her as much as possible (she said my mum is her grandma:-)). So I trust we have no regret and Jojo’s wishes fulfilled.